Scientific-and-technology activity plays a special role in MGSU (MSUCE). Organization and coordination of this area are provided by the Scientific and Technical Department. The main task of Scientific and Technical Department is the transfer and commercialization of scientific and research activities results in the production technology of construction industry around the world. Human resources development by attracting university students, graduates and young scientists to the knowledge-intensive applications addressed by the scientific and industrial activity. An important aspect of MGSU (MSUCE) research and innovation complex activity is the involvement of students and graduate students in the research activities of the university. Participation of young scientists in conferences, seminar-schools, competitions for grants, and exhibitions is an integral part of MGSU (MSUCE) scientific and technical activities. issuing and publishing of the books «We are from MICI»; publishing of the first book from the anthology «MGSU-MICI faculties. History and Actual.» , the first edition of the book «My dear Capital, my golden Moscow» dedicated to the MGSU and its graduate's participation to the Moscow construction at the turn of 20-21th centuries; participation of the special NRU MGSU events, anniversaries etc. correcting information after the evaluation of any activities conducted by the Expert Council of the representatives of management, social, administrative, legal and law enforcement organizations. University Research Institutes, Scientific Educational Centers, Research Laboratories, and Scientific-Technical Centers are involved in the scientific and technical activities. For efficient use of innovative equipment in the educational and research processes as well as for full use of university units there functions an Innovative Equipment Common Use Center. Scientific and Innovation activity of MGSU (MSUCE) is determined by strategic and tactical objectives of the National Research University, the main of which is the development of scientific potential and the formation of MGSU (MSUCE) innovative zone. - information systems technology in designing, construction, building maintenance, and science management. - energy sector and special construction: the development and modernization of technical solutions and technologies with regard to energy, water and environmental construction; geotechnical problems of the building. - urban planning; economics and construction management; estate property; housing and communal services and estate property management, modern principles of investment and construction activity management. Research investigations are carried out in three research institutes, 39 research laboratories and centres, as well as in separate multidisciplinary departments of the University. The basis of the scientific potential of the University is Scientific Research Institutes, Research and Education Centers, in which unique complexes of high-tech research equipment having no analogues in Russia are concentrated. Research Institutes and Research Educational Centers train researchers and provide the results of intellectual activities. Over the past 5 years, MGSU (MSUCE) has achieved more than 100 results of intellectual activities. MGSU (MSUCE) specialists carried out a series of Research and Advanced Development commissioned by the Ministry of Education and Science of the Russian Federation, as well as by other ministries, departments, and big organizations, including Olympstroy, Rosnano, JSC Concern Rosenergoatom, the Federal Space Agency (Roscosmos), OAO Gazprom, JSC Transneft, etc. MGSU (MSUCE) takes an active part in updating the regulatory documents in the construction sector (SNIP, GOST, etc.). Much attention is paid to the actual problem of harmonization of regulatory documents of the Russian Federation to the European standards in the field of construction (Eurocodes). MGSU (MSUCE) is a training centre for teachers of the Eurocodes. An actual purpose of MGSU (MSUCE) scientific and innovative activities is training the top qualification specialists in postgraduate and doctoral university. At present candidates for 35 specialities and doctors — for 24 specialities are trained. One of the main missions of MGSU (MSUCE) as a National research university is a training of highly skilled experts and staff of the highest qualification at post-graduate courses, as well as scientists at university's doctorate. All necessary conditions for continuous education are established at MGSU (MSUCE) due to the availability of corresponding educational programs at all educational levels. "Master" qualification (degree) is the second higher professional education level after a bachelor. Over 500 students study on MGSU (MSUCE) master courses at 26 university's chairs presently. Master course students can concentrate on highly specialized matters during their study, learn in more detail spheres needed for their future professional work, including the whole variety of innovative directions. Training at master courses gives the first experience of scientific work, helps master in methods and skills of researching. Master course students can, while obtaining higher education, try themselves as researchers and then make sound decisions on the need for further study at the postgraduate program. Both desire to develop by obtaining new competencies and knowledge and strive to build careers according to modern labour market requirements can be pointed to reasons for further study at the master course. At that, opportunities for creative potential realization in master thesis writing shouldn't also be forgotten. All students who study for the account of federal budget obtain state grants. Additionally, students can obtain increased grants for success in various activities (study, science-and-research, social, cultural creative and sports). Entrance to MGSU (MSUCE) master courses both at places financed from the federal budget and paid by students is done on a competitive basis and by application from persons who have state higher education diplomas (bachelors or specialists), according to results of entrance tests held by MGSU (MSUCE) on its own. Postgraduate program and doctorate are open at Moscow State University of Civil Engineering since 1932 and are the main forms of science-and-pedagogy and scientific experts training. They give opportunities for education level and science-and-pedagogy qualification increasing. Theses in MGSU (MSUCE) doctorate are prepared on 20 scientific specialities according to the nomenclature of science officers' specialities approved by Ministry of Education and Science of the Russian Federation. Officers from scientific or educational institutions who perform pedagogic and/or scientific (science-and-research) activity can be sent to MGSU (MSUCE) doctorate. MGSU (MSUCE) has been delivering, since 2009, training for post-graduates and university employees based on teaching contracts according to Labor Code of Russian Federation to improve academic staff professional level, prepare higher qualification staff for MGSU (MSUCE) structural divisions (chairs, research laboratories, Science and Education Center), and to provide availability of professional education for RF citizens interested in long-term cooperation. The University keeps contacts with the variety of partner organizations which take an active part in the educational process of teaching students and higher qualification staff on the postgraduate program with further engagement in large domestic construction companies. University's international activity is an integral part of preparing highly skilled expert freely orienting in domestic and foreign operational procedures, well acquainted with global construction practice, having a spacious mind and competitive at the global market. - co-publishing in scientific journals and collected papers. Over 150 students, post-graduates and university lecturers annually take part in international exchange programs within the scope of implementation of international contracts with foreign higher educational institutions — partners. Over 200 university lecturers take part in international programs of additional education, qualification improvement, and field study. Over 1500 MGSU (MSUCE) students and lecturers take part annually in international conferences, workshops, exhibitions and forums. interaction with foreign higher education institutions in areas of international academic mobility development, coordination of development and implementation of joint educational programs as part of efficient promotion of university internationalization and Bologna process provisions implementation. The University makes annual student exchange for field training with Wrocław University of Technology (Poland), Bialystok University of Technology (Poland), Donbas National Academy of Civil Engineering (Ukraine), High School of Industrial and Civil Construction (France), University of Eindhoven of Technology (The Netherlands), University of Applied Technical and Economics Sciences in Berlin (Germany), Bauhaus University Weimar (Germany), University of Architecture, Civil Engineering and Geodesy in Sofia (Bulgaria) and Maribor University (Slovenia). The best MGSU (MSUCE) students are sent to the largest construction companies for field training: Alpine (Austria), Strabag (Austria), МС-Bauchemie (Germany), Vermogen und Bau Baden-Wurttemberg (Germany), Bouygues (France), Statens Fastighetsverk (Sweden) and others. Master's program students and post-graduates from our university pass academic study placement in universities in France (ESTP), Germany (Bauhaus University, Berlin Technical University), China (Harbin University), and Czech Republic (Czech Technical University). The best MGSU (MSUCE) students are sent annually to summer schools at Warsaw University of Technology, High School of Industrial and Civil Construction (Paris), Maribor University, Bauhaus University, and Cambridge University. MGSU (MSUCE) performs diploma students exchanges for exchange education with leading European higher education institutions. MGSU (MSUCE) has broad international relations with universities, scientific institutions, and construction companies from both former USSR and other countries. Currently, MGSU (MSUCE) cooperates actively with 80 foreign higher educational institutions from 35 countries. They include: Austria, Belarus, Bulgaria, China, Czech Republic, France, Finland, Great Britain, Germany, Hungary, Israel, Iran, Japan, Kazakhstan, Mongolia, Moldova, the Netherlands, Peru, Poland, Slovenia, Slovakia, Scotland, Tajikistan, the USA, Ukraine, Uzbekistan, and Vietnam. - Russian-Slovenian youth project "Moose Island", and many others. MGSU (MSUCE) takes part in the annual open public competition for obtaining grants from the President of the Russian Federation for Russian students and post-graduates to study at foreign higher educational institutions. 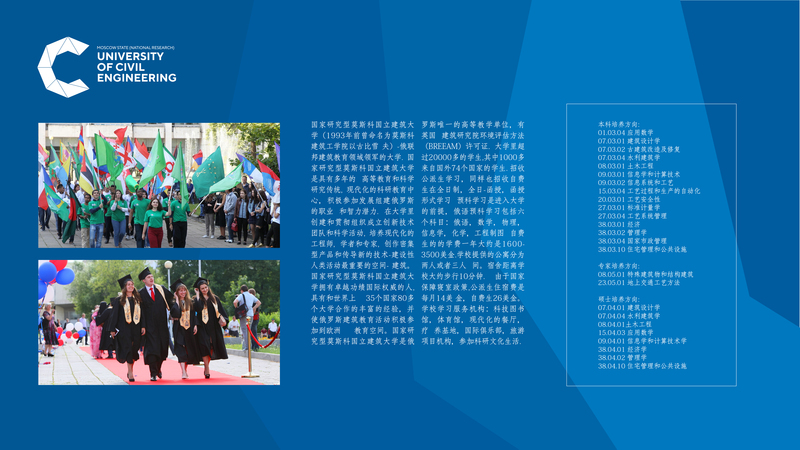 The Center for work with foreign students and language training coordinates study of foreign citizens at all teaching levels and directions implemented at MGSU (MSUCE). Foreign citizens of over 50 countries from all continents study at MGSU (MSUCE) Pre-university study programs training: "Russian for foreigners" and "Preparation to entering the University". Over 3,500 engineers, candidates and doctors of science from 108 countries of the world obtained their education at MGSU (MSUCE). Programs of further professional education in Russian and foreign languages are widely represented and successfully implemented at the centre. MGSU (MSUCE) students take an active part in summer language schools in Russia, Germany, Spain, Great Britain, France, Ireland and other countries. 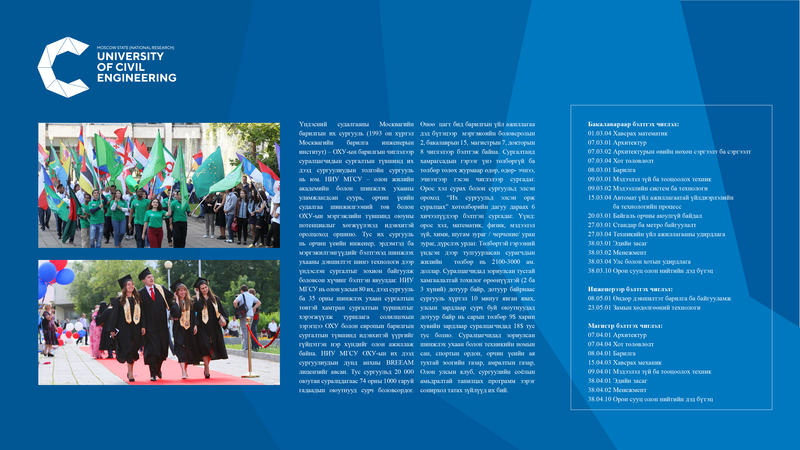 NRU MGSU publishes a monthly newspaper «Construction Stuff» about the academic, social and cultural life in NRU MGSU. Interclub «Planet MGSU» - is a part of the structure of the Institute of International Education and Language Communication. represent the interests, activities, or organize activities aimed at strengthening inter-ethnic relations. Carrying out activities of such level confirms the idea of the effectiveness and productivity of joint efforts to create a communicative space between people of different cultural and religious traditions. Interclub is a key community in the education of culture of interethnic communication in high school, strengthening of a common general education space. An asset of the Interclub are the leaders united against domestic extremism, international and religious conflicts. Each member of the Interclub in the capabilities of his/hers practical self-affirmation, accounting and implementation of his/hers distinctive interests, talents, abilities, needs and well-being feels like a person, an integral part of the team and society. On this basis, the national well-being of both organization and the individual student is formed.